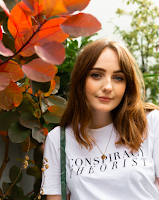 Skincare blog posts are a bit of a rarity here on tie dye eyes, but after the past few months I've had skin wise, I've learned a good few lessons and found some of the best skincare for dry skin, so thought I'd share my skincare heroes with you all. I hope this helps at least one of you guys who can relate to my dry and sensitive skin troubles. As a teenager, I had fairly oily skin and really struggled with acne. Then, as I moved away for uni and went through a breakup, my skin freaked out and developed eczema. Best of both worlds, eh? Since then, my skin has definitely been more dry than oily, meaning over the past few years I've experimented with skincare a hell of a lot, and have now finally found the right routine for me and my dry, sensitive skin. Whilst it's tempting to smother your face in anything remotely hydrating you can find, I've found it's best to keep my skincare routine to a few, simple steps. Of a morning, my facial skincare routine is nothing special. I simply splash my face with water and use some moisturiser to prep my face for makeup. This tends to rotate between my beloved By Terry Hydra-Comfort Rich Aqua Balm, a Boots own brand sensitive day moisturiser with SPF 15 and TonyMoly banana sleeping mask. Granted, a banana scented moisturiser isn't always the best choice for someone with sensitive skin, but when I'm feeling brave I do love to use it. But this post is all about my evening skin care routine, which has just four simple steps. 1. Take off my makeup with Garnier's good old micellar water. I know there is an option for sensitive skin, but I've found the original (the one with the pink lid) works well for me. Ideally, I'd like to switch to a cruelty free makeup remover, as I know Garnier isn't always the most ethical of brands, but right now I'm using this as I know my skin can handle it. If you have any suggestions for cruelty free alternatives though, make sure to comment down below! 2. 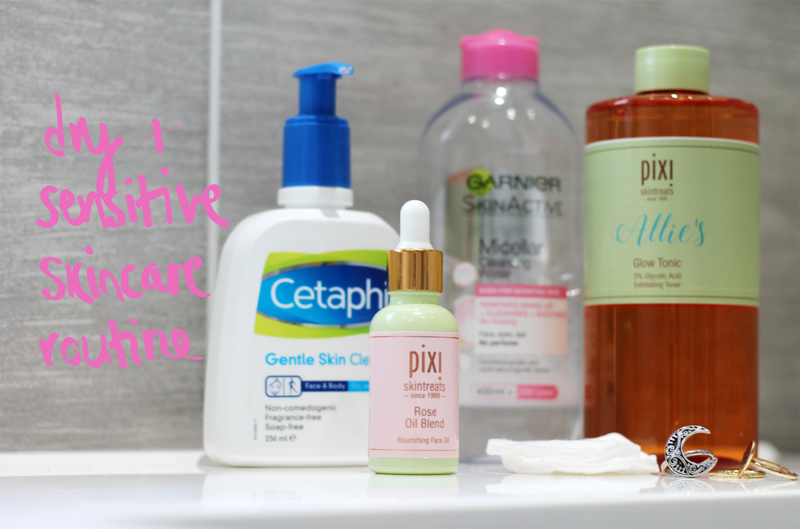 Now, I have used a good few cleansers in my time, and there are some I still love, like the Pixi double cleanse, but when my skin is particularly dry (hello eczema on eyelid), Cetaphil gentle skin cleanser is the one for me. Cetaphil do the best cleanser for sensitive skin. It's free of all the bad stuff and I've never met anybody who has reacted badly to this. It's so gentle, and removes most of what is left over on my face. 3. When I've been wearing a lot of makeup, I'll give my face the once-over with Pixi's famous glow tonic*. I swear by this stuff. The instructions say to use it in the morning and the evening everyday, but if you struggle with dry or sensitive skin like me, I recommend using glow tonic a couple of times a week. It might not be nominated as one of the best toners for dry skin, but this stuff is my skincare holy grail. It will leave your face feeling squeaky clean and get rid of all that dead skin. 4. We could be here all day debating what is the best face moisturiser for dry skin, but what I've found works best for me of an evening is face oil. When I first heard of people adding oil to their face, I felt ill. The idea of adding oil onto already acne prone skin seemed ridiculous, but since getting Pixi rose oil blend*, I felt brave and decided to give it a go. I haven't turned back since. I don't use this every night religiously, because sometimes my skin is just feeling too bad to do anything but the basics, but most nights I'll add a few drops of this onto my face after cleansing and toning. It makes my skin feel super soft and even lasts until the next morning, so although small, it sure is mighty. So, there you have it, my take on the best skin care for dry and sensitive skin. Hopefully some of these recommendations help you out, but if you have any other suggestions make sure to leave them down below so we can all help each other out! *Affiliate links are used in this post. Items marked with (*) are gifted, all opinions are my own. I love the Garnier Micellar Water too! It works so well for me. 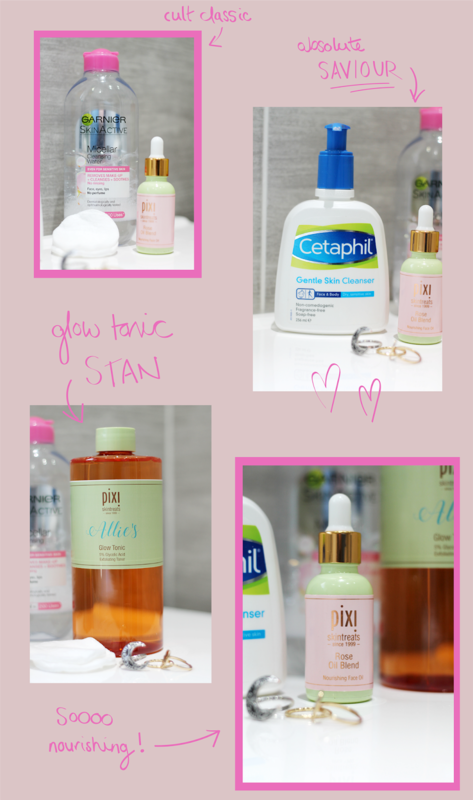 The Pixi Glow Tonic is on my list to try!